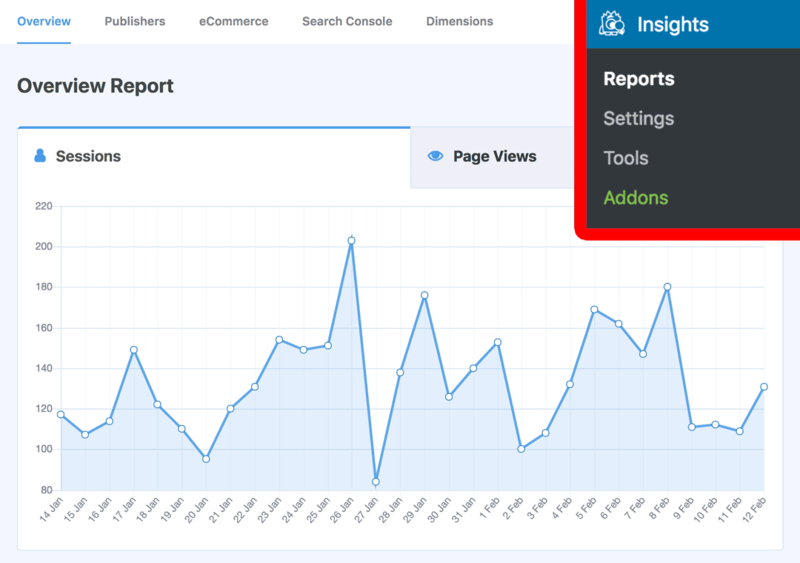 With MonsterInsights, you can get your Google Analytics report right in your WordPress dashboard. It allows you to see your site’s performance at a glance. In this article, we’ll show you where to find the Google Analytics report in your WordPress dashboard. Before we get started, we’re assuming that you’ve already installed the MonsterInsights plugin and authenticated it with your Google Analytics account. 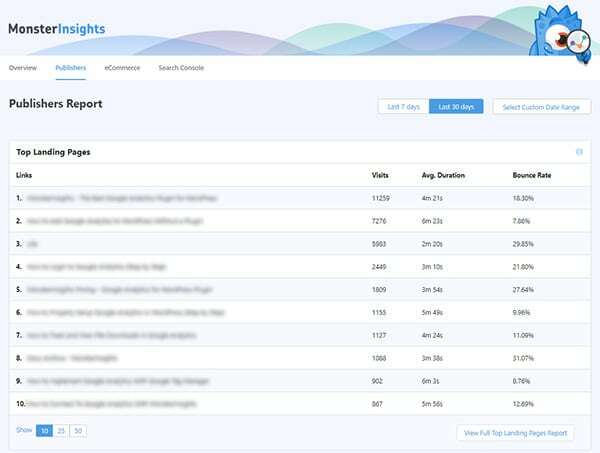 To view the report, you just need to go to Insights » Reports in your WordPress dashboard. You can get a detailed Analytics report that shows you page views, top posts and pages, top traffic sources and top countries. With the Plus Level of MonsterInsights, you will get access to the Publishers reporting area. This area tells you Top Landing Pages, Top Exit Pages, Top Outbound Links, Top Affiliate Links, Top Download Links, and the demographics of your users. To view the Publishers report, just click on the Publishers tab in your MonsterInsights report page. With the Pro Tier of MonsterInsights, you will get access to the eCommerce Addon and the eCommerce reporting area. 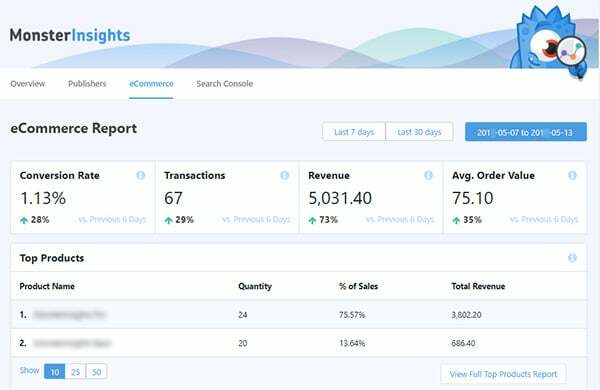 This area shows you at a glance your Conversion Rate, Amount of Transactions, Amount of Revenue, Average Order Value, Top Products, and Top Conversion Sources. 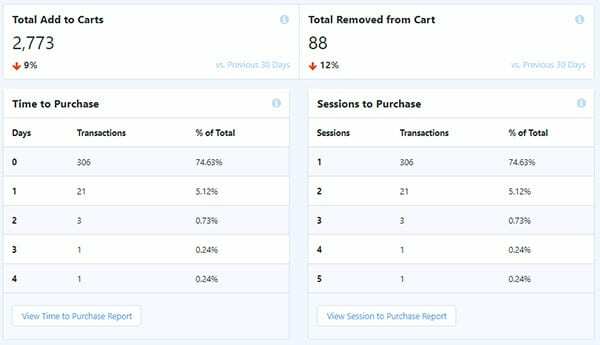 Additionally, you can see Total Add to Carts, Total Removed from Cart, Time to Purchase, and Sessions to Purchase, all at a glance! To view the eCommerce report, just click on the eCommerce tab in your MonsterInsights report page. The Search Console Report shows you your Top 50 Google Search Terms. 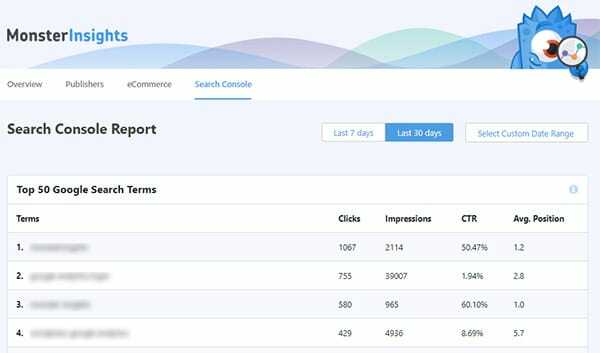 Next to each term it shows, Clicks, Impressions, Click-Through Rate, and Average Position of each term. With the Custom Dimensions addon, you can choose to track your own custom data and display it in your MonsterInsights dashboard and reports. To view the custom dimensions report, just click on the Custom Dimensions tab in your MonsterInsights report page.